A Sunshine Coast woman has won 12 months of free electricity, a local energy solutions provider has announced. Locality Planning Energy (LPE) announced Cara McKay won its energy competition after the company judged more than 500 entries from individuals and families vying for the prize. The news was life-changing for the hardworking McKay family, who spends more than $2000 annually on energy-related costs. Cara and husband Peter, a carpet layer, will spend the savings on a family holiday over Christmas at one of their favourite domestic destinations with their three children aged 3, 6 and 10. 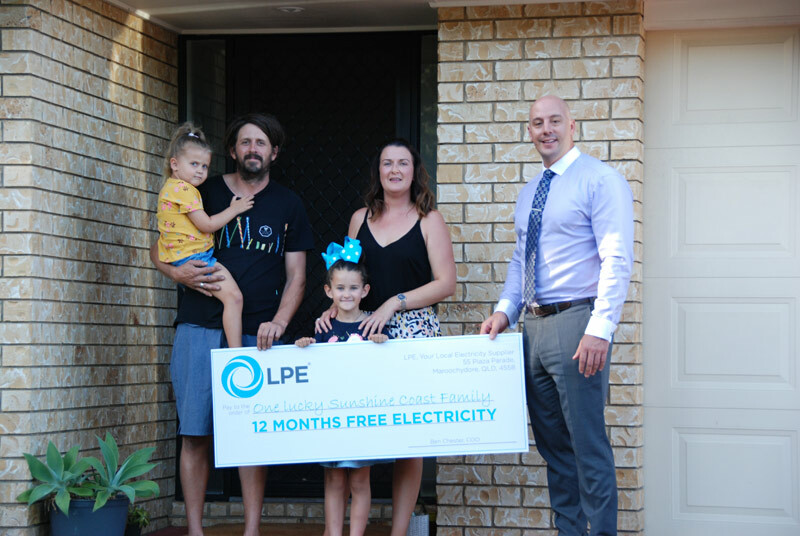 LPE hosted the competition as a way to connect with customers and introduce themselves as a local energy option for the Sunshine Coast community. The Maroochydore-based business employs 35 full time staff and has grown rapidly since it was founded in 2012, now servicing more than 200 businesses and more than 15,000 residences. The electricity supplier supports local community clubs and, with each new customer, LPE donates $30 to a local club of the customer’s choice.